The Stratasys Fortus 380mc™ Carbon Fiber Edition 3D Printer combines production grade accuracy, reliability and repeatability with the strength and durability of carbon-reinforced nylon. 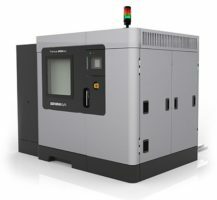 It is powered by proven Stratasys FDM 3D printing technology and designed to tackle the tough engineering and manufacturing challenges on the factory floor. It fills the gap between unreliable and capability limiting desktop 3D printers and high-end production 3D printers, providing a low-risk opportunity to 3D print strong jigs and fixtures, prototypes and end-use parts. 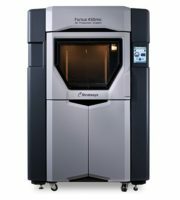 The Stratasys Fortus 380mc Carbon Fiber edition 3D printer is designed to produce accurate, reliable and high strength parts. It is a solution built to tackle functional prototyping, production parts and rugged tooling with the strength and stiffness of carbon-filled nylon material and general purpose ASA. Reinvent your manufacturing tooling production and take advantage of the benefits that additive manufacturing offers. With the Stratasys Fortus 380mc Carbon Fiber 3D printer you can produce strong but lightweight production tools on-demand in the aerospace, automotive and industrial manufacturing industries. You have the complete design freedom to 3D print complex shapes, including voids and undercuts, along with light weighting the interior of the print to find the perfect balance between cost, strength, and performance. FDM Nylon 12CF™ 3D printing material was specifically engineered by the Stratasys materials team to have a high strength-to-weight ratio and tensile strength. It is a chopped carbon fiber-filled (35% by weight) polyamide 12 with the highest specific modulus of any FDM 3D printer material. Due to the unique design of the material and the directional orientation of carbon fibers, Nylon 12CF exhibits anisotropic properties that can be tailored similar to a composite laminate. This enables parts to have a higher uniaxial stiffness than injection molded parts of the same material, yet still have the freedom of design associated with additive manufacturing. When it comes to 3D printing, trust Stratasys Fortus 3D printers to get the job done. At the core, the Fortus 380mc Carbon Fiber Edition is powered by fused deposition modeling 3D printing technology, enabling you to print confidently with materials that can endure heat, chemicals, and high-impact. The system is designed to have industrial reliability and throughput, yet requires no special facilities to operate or special skills required to maintain and print. Trust the name that invented additive manufacturing, and has been enabling innovation for over 30 years. Create highly customized tooling, resulting in greater productivity, capability and ergonomics. Lower production time and cost by producing custom jigs and fixtures in-house, on-demand. Utah Trikes, a company that specializes in manufacturing trikes, quads, and custom wheelchairs, has adopted additive manufacturing in order to tackle projects with high customization requirements. Their Stratasys 3D printer has allowed them to product jigs and fixtures, and low-volume production runs in-house. The Stratasys Fortus 380mc Carbon Fiber Edition is powered by both GrabCAD Print and Insight software, providing you with an easy, accessible and smooth workflow for additive manufacturing. Now you can build consistently high-quality parts, with exceptional UB stability and the best aesthetics of any FDM thermoplastic printing material. Limited, attendance for job start and stop required. All Fortus® systems include Insight and Control Center job processing and management software. Compatible with GrabCAD Print for use with job reports, scheduling and remote monitoring. 2012 R2. Insight software requires a 64-bit operating system.